There are some green-themed challenges in blogland at the moment, and even though at this time of year it is mainly about St Patrick's or spring, I think it can well be applied to Christmas, too :) So that's what I did, and I'm entering my Christmas card into these challenges: All Dressed Up (ATG), Incy Wincy (Shades of Green), Crafty Gals Corner (All about the Girls), Simon Says Wednesday (A bit O'Green), Lil' Patch (ATG), Pile it On (Green + two colors: red & yellow), Inky Impressions (Let's hear it for the Girl). hello Jessi! this is adorable luv the glittery bow! I am so glad you played along with us at simon says stamp wednesday challenge! 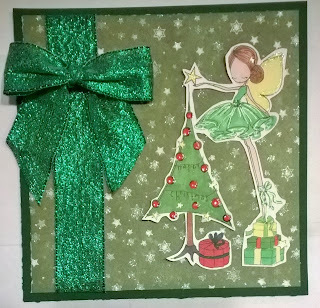 Great shades of green in this lovely christmas card. Thank you for joining in the Shades of Green challenge at Incy Wincy Designs. What gorgeous ribbon! Love the background paper. Thank you for joining us at Crafty Gals Corner for our All About the Girls challenge.